Has anybody ever pre-ordered an event diecast before? 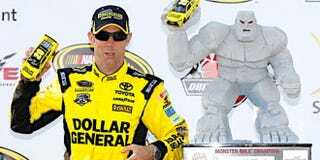 I pre ordered Matt Kenseth’s Dover winning car from the race i was just at. And I was wondering if anybody on here ever pre ordered any kind of pre production casting. It doesn’t even have to of been a Nascar or racing casting. I was just curious how long the wait could potentially be, from pre production to your front step. Image property of Lionel Racing.